In a "proof of concept" study, scientists at Johns Hopkins Medicine say they have successfully delivered nano-size packets of genetic code called microRNAs to treat human brain tumors implanted in mice. The contents of the super-small containers were designed to target cancer stem cells, a kind of cellular "seed" that produces countless progeny and is a relentless barrier to ridding the brain of malignant cells. "Brain cancer is one of the most widely understood cancers in terms of its genetic makeup, but we have yet to develop a good treatment for it," says John Laterra, M.D., Ph.D., professor of neurology, oncology and neuroscience at the Johns Hopkins University School of Medicine and a research scientist at the Kennedy Krieger Institute. "The resilience of cancer stem cells and the blood-brain barrier are major hurdles." "To modernize brain tumor treatments, we need tools and methods that bypass the blood-brain barrier," says Jordan Green, Ph.D., professor of biomedical engineering, ophthalmology, oncology, neurosurgery, materials science and engineering and chemical and biomolecular engineering at the Johns Hopkins University School of Medicine. "We need technology to safely and effectively deliver sensitive genetic medicines directly to tumors without damaging normal tissue." Scientists have long suspected that cancer stem cells are at the root of what drives the return and spread of glioblastoma and other cancers. These stem cells give rise to other cancer cells and, if they evade the surgeon's knife, can lead to an entirely new tumor. The packets are made of biodegradable plastic similar to material used for surgical sutures and that degrades over time. They are 1,000 times smaller than the width of a human hair and typical of the size and shape of natural components that cells use to communicate. 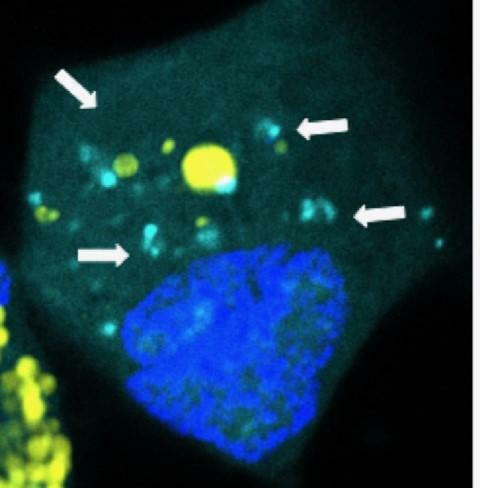 When cancer cells engulf the packets, they break apart and release their microRNA "payload" specifically where the microRNAs need to take action within the cancer cells. When microRNAs bind to these messenger RNAs, they block their protein-making abilities and turn off programs that drive the cancer cells' stemlike characteristics. Without their stemlike properties, the cancer cells are more differentiated, they lose their capacity to propagate tumors, and they may be more susceptible to radiation and drugs.